Below is an image I captured while in Alaska in August/September of 2010. 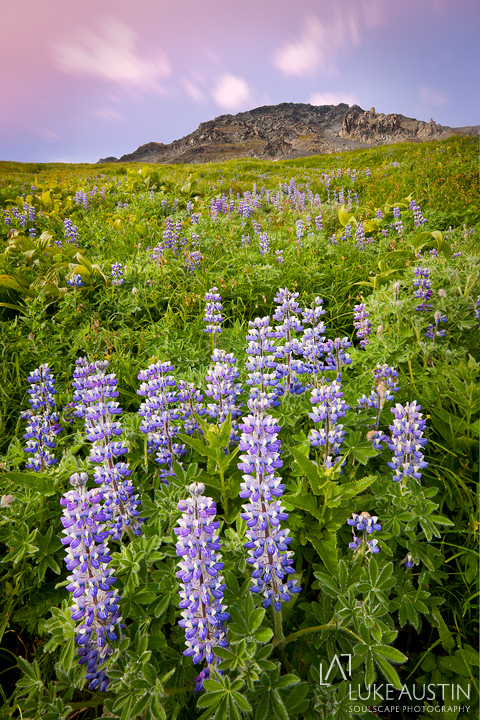 I was surprised to find these Lupins on the mountainside on the hike up to the Harding Icefield. All the wildflowers at a lower elevation were well past their best before date but as I slowly climbed higher the foliage and wildflowers were in far better shape. I decided I would continue on and upward and shoot the Lupin on the way back down later in the afternoon. Once I returned to the area I had briefly scouted on my way up it began raining, only for a short period however. There was just enough rain to line all the leaves with tiny beads of water (clearly visible in print) and make the mountainside wet enough to cause me to slip n slide all over the place. Trying to hunt out a composition that I felt worked in the slippery conditions was frustrating and after one bad spill it became painful (a rock in the behind will do that to you. I said ROCK!). Anyway after finding a composition I was happy with I sat, waited and recovered.